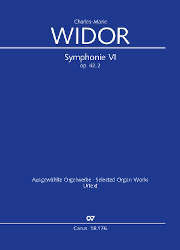 It is no coincidence that the Toccata from Widor’s Vth Organ Symphony is his best-known composition. Who can resist its thrilling verve? 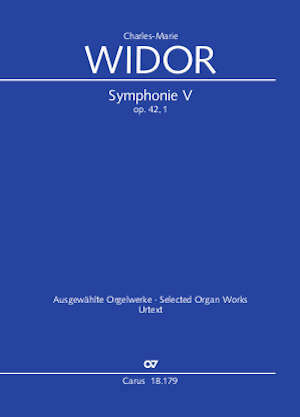 Not only this, but also the other movements of this unique work of the organ repertoire win you over immediately – the first with its march-like, majestic, much-varied theme; the second with its wonderfully elegiac oboe melody, flowing along over staccato sixteenth notes; and the two slow movements, of which the melancholy, almost static Adagio forms the greatest contrast imaginable to the following triumphal Toccata. The Carus Urtext edition is based on the Paris edition of 1928/29, the last one to be published during Widor’s lifetime. The corrections which the composer made after the publication of this edition have also been taken into consideration. As well as this, earlier editions have been consulted for comparison to clarify individual variant readings. Editorial suggestions on the performance of individual passages complete the new edition.